COVER PHOTOGRAPH: Scientist measures 350-meter-high fountain during March 1983 eruption at Kilauea Volcano, Hawaii. 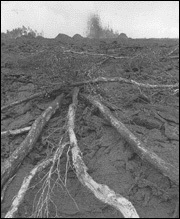 Lava fountains, approximately 100 meters high, play at the vent during the September 1977 eruption of Kilauea Volcano. New lava flows and downed trees in foreground. (Photo by Boone Morrison.) 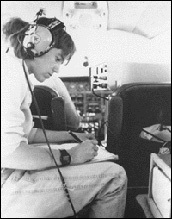 Geologist records data at Redoubt Volcano, Alaska, while operating a Correlation Spectrometer (COSPEC), to measure the amount of sulfur dioxide in volcanic plumes. This on-line edition contains the text from the original book in its entirety. Some figures have been modified to enhance legibility at screen resolutions.